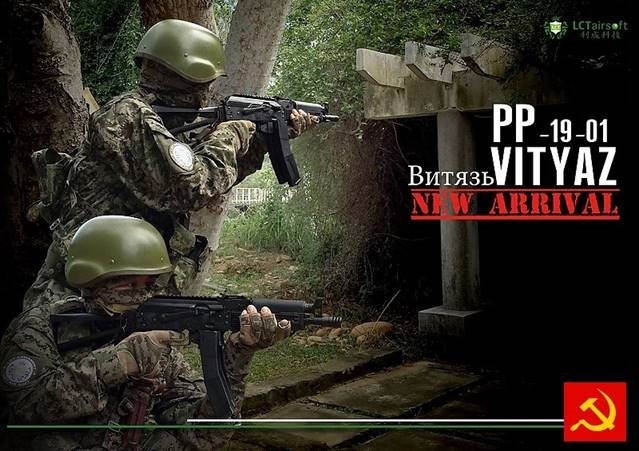 LCT Vityaz PP-19-01 was introduced in 2015, and suddenly drew much attention not only because of the realistic compact size with 9mm style magazine but also its affordable price in LCT AK family. Inside the familiar stamped steel receiver is a 9mm ball bearing Ver.3 reinforced gearbox. In spite of its steel side rail, LCT mounts a 20mm Picatinny rail upon the top cover so that there won’t be interference between a folding stock and the optical aiming device mounting on top cover. 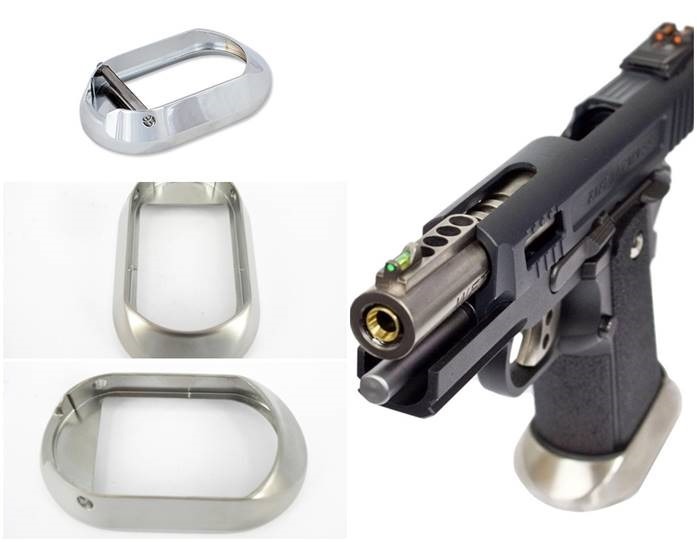 Its double magazines【PK263】carry 100 pellets, so each magazine has 50 pellets inside. The capacity for single spare magazines starts from 50 rds【PK275】, 100 rds【PK276】, to 200rds【PK277】. Humm…will the length of magazine be an issue when prone shooting? It’s better to ask Russia special force and the Police, since Vityaz SMG from Izhmash has been equipped from 2008 till now. This outfit not only decorates your Glock replica, but also has a practical purpose- prevent palm jamming when fast changing magazines. It fits for WE Glock 17/18/34 series. Even if you don’t have a silver slide Glock replica generation 3 like【GP616-SV】,【GP617A-SV】,or【GP625A-SV】 (click to access), the shinning appearance still attract much attention in all black finishing. For gunners seeking black, Jia Dyi recommends a nylon construction of Guarder,【GLK-71(BK)】. It’s a device that carries both exterior uniqueness and practical function for your match-grade pistol. Silver outlooks with aluminum construction, easy to be added to your WE Hi-capa series. Take WE 3.8” Hi-capa, for example, 【GP681-38R-BK】has utilized the element in factory setting, and been popular since its first introduction in 2015. For the other custom Hi-capa Force series GBB pistol dressed with magwell, please click 《Jia Dyi：In the Name of Hi-capa》 to see detail pictures. Strongly suggest for beginner who wish to be an AIPSC player! 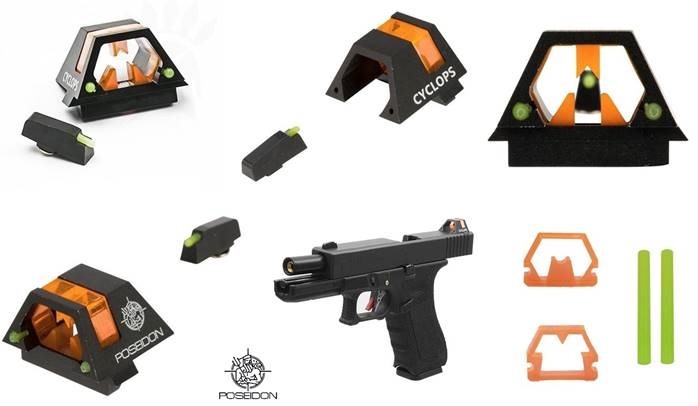 Referential to the concept of “Ghost Ring” applied to Snake Eye® on real Glock, Poseidon created the Cyclops® for tactical shooting by framing your target. Full aluminum HEX structure installed with orange ring is meant to fast capture and provides suppressing fire on nearby targets under daylight with two eyes-opened. Click here to know the《Designing ideology of Cyclops®(with ENG subtitles)》through interview with Poseidon. Germany-made super luminous powder was formed into three night-glowing cylinders to facilitate night raid or precision shooting. Two latest conversion kits are tombstone shape and three teeth style, the former aims for accuracy and the later focuses on fast framing again. 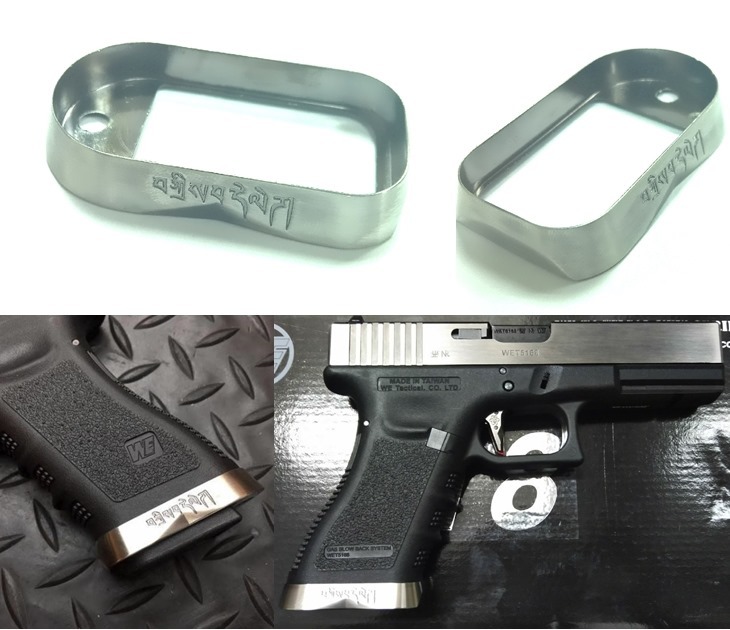 A drop-in design for all Glock replicas of Tokyo Marui, WE, B&W, and those follows Marui compatible specification, while KJ needs a little bit of modification on the base. If you wish to know more about Jia Dyi and its sales mix, we urge you to visit our Face Book photo album; basically it is composed of newsletter every week, or contact us at sales@jiadyi.com to open a reciprocal dialogue with promising future.